There will be more cycling in a couple of weeks time. Dgym and I are going for a couple of weeks in Cornwall (the home of his trike) and I'm then off for a couple more weeks Somewhere Else (Which at the moment could be anywhere from Scandinavia to Central Europe - as usual I have too many ideas and can't just pick one of them!). I'm looking forward to getting Dgym back on the road, he seems a bit under-enthusiastic and hasn't been paying his trike enough attention lately, but hopefully he'll get over that. In the meantime, we've been thinking a bit about the equipment we took along with us last year, how that worked out for us and what we learned for next time, and thought it'd be useful to write a bit about that. We'll start with camping. The small free-standing tent was borrowed, and we regarded it as an item of "emergency equipment", to be used in case we couldn't find anywhere to stay. I was up for camping but Dgym, who was several inches too tall to fit in comfortably, felt that it served him better as a headrest. We came close to camping when we were unable to find a room in Dieppe, but didn't end up using it (albeit not quite for its intended purpose) until we were desperate for a mosquito net in Poland. 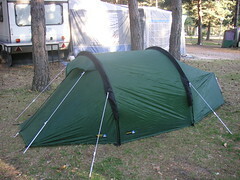 We camped twice in Denmark for financial reasons, and although the campsites were lovely (particularly Roskilde) I don't think Dgym was particularly comfortable, so once back in the UK we decided to splash out on a new tent and ended up ordering a Terra Nova Laserlarge. We chose the Laserlarge on the grounds that it was both larger and lighter than the old tent, easy to put up and not too expensive. We set out for Spain and Portugal intending to get a lot of use out of it, but the campsites weren't having any of it and in our four weeks of travelling we only found two that were open. So we haven't had much opportunity to use it as we'd have liked, but so far it seems like a good choice, it's fairly easy to put up, quite light, there's plenty of room for both of us and anything precious that we want to keep close at hand (e.g. Grey Mouse) and space in the vestibule for a couple of panniers - although the hard ground at the Portuguese campsite did have us wishing we'd gone for a freestanding model. Our matching left/right zipping Rab S12 sleeping bags were chosen for their thermal properties. When choosing a sleeping bag, the first thing you decide is whether you want down (lightweight, compact, a bit more expensive, you're in a right mess if you get it wet) or synthetic (heavier, bulkier and not so much of a pain to dry out). We were a bit worried about the whole getting-it-wet thing so opted for synthetic. Getting a pair of matching bags with one left and one right zipper means two single bags can be zipped together so you can snuggle up for extra warmth, if you're into that sort of thing. Warmth was a priority as we were headed for Poland and thought we'd be getting there in late April / early May when there could still be snow there - furthermore, we could end up in the mountains. As it turned out, we got there in early June, it was baking hot, barely a hill in sight and we didn't use them anyway. Looking back, we both feel differently about this choice. I think we should have got lighter sleeping bags. They're big and bulky and we really didn't need bags that went down to -12C! They're useful to have in case we do want to tour colder places but if I had loads of money right now I'd buy a nice little down bag to use on future trips. Dgym still thinks we made the right choice as it was good to have them there in case of emergency, and he also points out that they are relatively light bulk, something that is good to have in panniers as it prevents you from filling the space with other, heavier, items. Thermarest self-inflating mattresses - We quite like these, they're fairly comfortable and the inflation works well, although it can be a bit of a pain squeezing that last bit of air out so you can roll them up properly. They came in handy during our recent house move, as our mattress moved several days after we did! This is something we didn't really do on our travels last year. With the exception of the fruit sandwiches incident we always ate out. This saved on carrying around loads of extra equipment, but also cost a lot of extra money and a stove really would have helped us that evening in Soncillo. My bank account tells me that self-catering on future trips would be a really good idea, so with that in mind I started researching camping stoves. Pretty much universal opinion among touring cyclists on the internet seemed to be that the Swedish meths-burning Trangia is the way to go - it's stable, it's windproof, it'll last you for years, if you don't like meths you can get a gas-burner addon and then it really is the king of all camping stoves. There are smaller and lighter stoves around but this one looked pretty nifty and I'm easily sold on the recommendation of dozens of fellow cyclists, so I went ahead and ordered the 27-1 ultralight, which arrived the other day (along with a Spork). I tried it out yesterday and will be reporting back on that soon.